Do you ever think about how often we indulge our five senses? Magical perceptions without which we couldn't understand the world around us, every moment of every day even during sleep! It's lilac time here in Normandy and despite the April showers which we've had this week my lilac tree is in bloom. As I cut some stems to enjoy indoors I noticed that the rosemary in the herb bed was covered in pretty little purple flowers, so I cut some of that too. I created a welcoming vignette on top of the chest of drawers in the entrance hall. 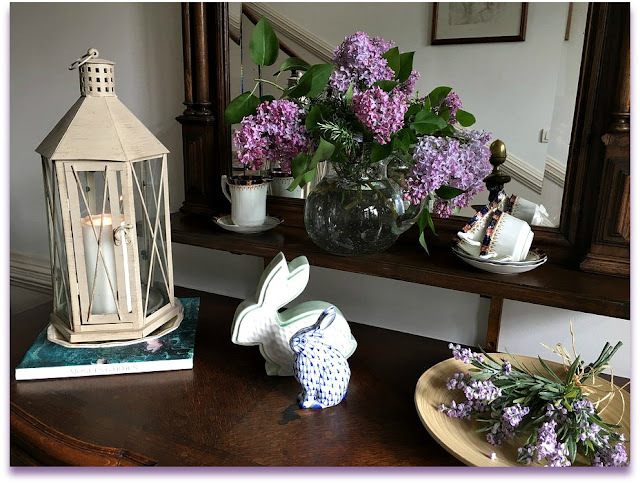 A tall lantern with a church candle which I can light in the evenings to add a warm glow, faux lavender stems in a contemporary shallow bowl are both Ikea purchases. The jug, cups and saucers are from my Grandmothers "bottom drawer". The two bunnies, which were part of my Easter décor, seem to have taken up permanent residence this Spring so I let them stay. The perfume from the lilac and rosemary together was divine. In Spring my thoughts turn to lighter fare, well, hearty soups and stews are for cold winter days aren't they? 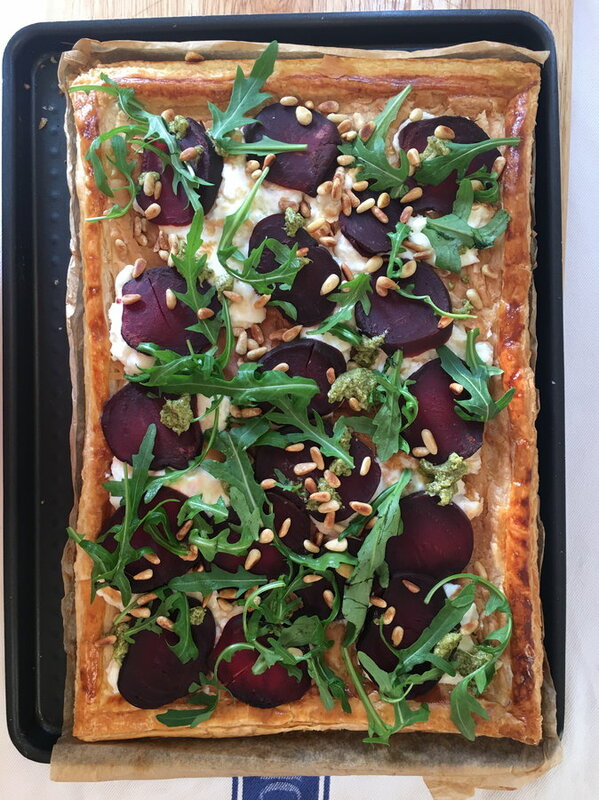 I made a beetroot and goat's cheese tart for supper one night last week, it was delicious. This might be considered a bit of a stretch but handling my scrapbooking materials is an indulgence for me, squirreling myself away in my attic craft room to play with paper and glue is the way I like to spend my free time. I created this layout for a challenge on the UK Scrappers website this week which was inspired by BBC Radio 4's weekly "Desert Island Discs" programme in which "castaways" have to choose 8 recordings and a book to take onto their Desert Island with them. Songbird - Eva Cassidy (which is also my funeral song). My book choice was A Redbird Christmas - Fannie Flagg (what else could it be?). Early in the week I had root canal treatment. I'll spare you the details but the sound of the dentists drill has always instilled fear in me ever since I was a little girl. Oh your house must smell divine - it certainly does look wonderful. I just adore the spring flowers. Ours are a ways behind - but coming on, and more warm weather coming later this week. Hope your week ahead is dentist-free and fabulous! Your entrance display is delightful and so welcoming. And thank you for the recipe, it sounds and looks delicious. I think I would want to squirrel myself away after root-canal work. Enjoy the rest of your week and thank you again for the link up. Maggie, the welcoming vignette and that tasty tart both have me wanting to sprout wings and fly in for a visit. I'm sorry you have had dentist visits. I share your feelings about the sound of the drill. Hope you have a great week. Thanks for hosting. 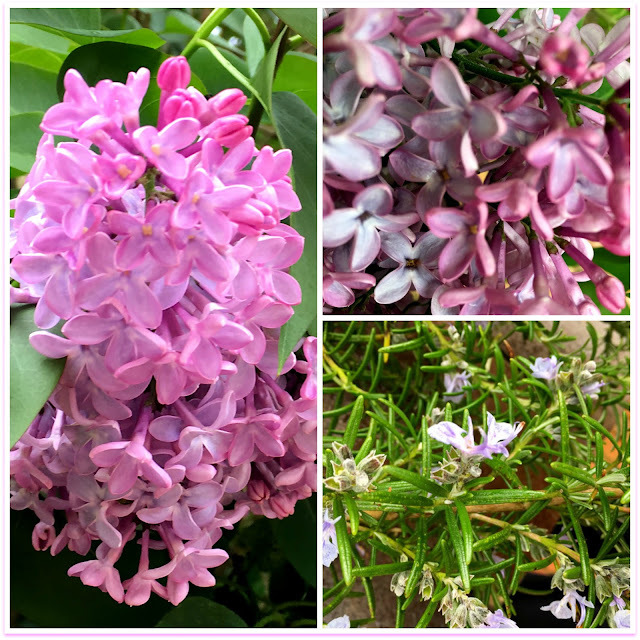 Your house must have smelled divine with all those cut lilacs inside! They are so beautiful. I grow rosemary, too, yet I don;t think I've ever seen it blossom. That also looked pretty. Your desert Island choices were interesting--now I'll have to think about mine. Glad the dental work is over for you--I also always dread the drill! Lovely to see the lilac and your fab display! Adore those bunnies. Glad they have decided to stay! The dentist drill....we all loathe that one! And it IS fun to play with paper crafts. I've been doing this too. Now I need to go outside and cut some flowers to bring inside. Yours are lovely! Happy MM! Good Morning, Maggie. I loved your post and a visit to the five senses. I love lilacs and they don't grow here. I miss them. Rosemary I have (thank goodness) and I've started a new lavender plant. Paper is fun and for me, the touch of yarn! I want to make that tart. Thanks for hosting. Have a fun filled week! I loved this fun and thoughtful post Maggie! So well written and pictured that I felt as if I enjoyed each sensual experience right along with you. (Well, enjoyed or not ....please no more root canals :)). I knew exactly what you meant by your grandmother’s bottom drawer ... mine had one just like that. Thank you so much for sharing and hosting! May all your sights ... and sounds .... be beautiful this week! Definitely an autumnal palette from me this week, Maggie! Nice to contrast it with your Spring exuberance. Always Maggie, your Mosaic Monday post entices the senses. Such a pleasure to see your lilacs in bloom. Thank you for share the good and the not so good today. Hello Maggie - your lilacs are lovely! Ours are just beginning to show the colour in the buds, but a few days of warm weather will have them blooming. It all happens so quickly. I don't envy you that root canal - such an ordeal, but always worth it! Divine lilac blossom - lovely combination lilac and rosemary. Your tart looks delicious and colourful .... thanks for the recipe! Hi Maggie! I forgot about Maggie May. I need that song in my collection. Oh, don't you LOVE the lilacs? I do. They smell so heavenly! I'm so sorry about the root canal, Maggie. Not pleasant, but hopefully things are better now. Your sensory post is delightful (except for that last thing...:). As Pondside mentioned, the lilacs are just getting ready to open here and I'm anticipating bringing them indoors and filling my home with the same scent as yours. Our rosemary is blooming, too. The tart looks delicious and pretty. Maggie, what a beautiful post! I love your welcoming vignette in your entry. And the tart looks marvelous. Thank you for hosting. I like your music choices. I won't tell you about the time I chose to have a root canal without painkiller. It is lovely to see your gorgeous syringas <3 I have not participated for a while - the winter in Finland has been tough. I hope that the summer brings new energy. What a very creative blog. I stay. Oh Maggie, I love every bit of this post! 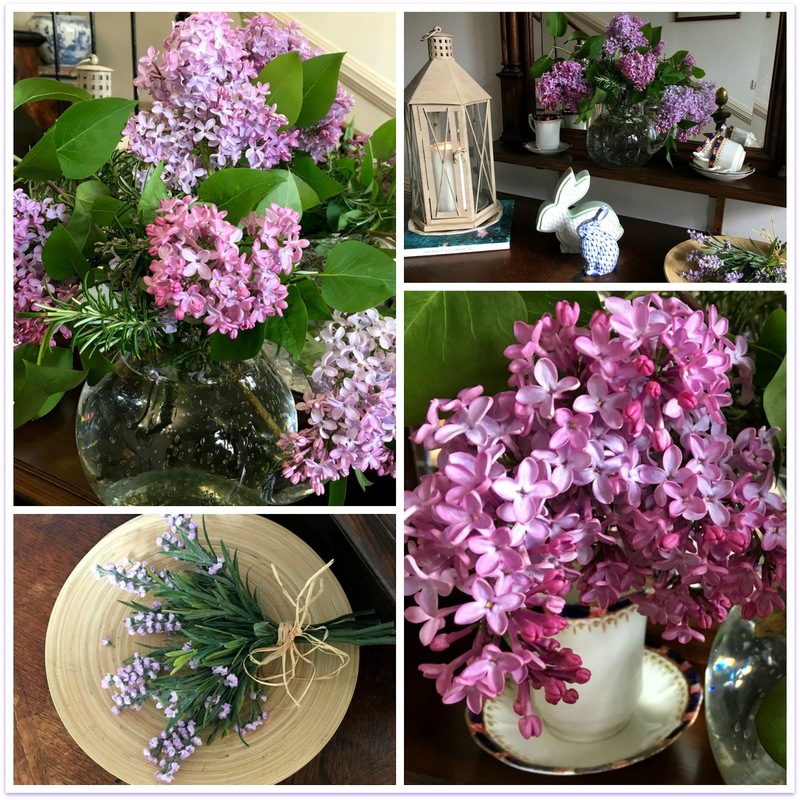 Those lilacs and rosemary -- what a treat for anyone entering your home. I especially love the way you staged the rosemary -- that's really beautiful. And I love the Desert Island idea. I'm glad you're still doing your mixed media. I feel like I've landed in a little haven here! Thank you for this post! I brings back the memories of the lilac and honeysuckle bushes we had in the backyard when I was growing up. Wishing you well! Maggie - my sister's lilac bush was just starting to bloom while we were in Ohio, and I took a good sniff every time I walked by it! 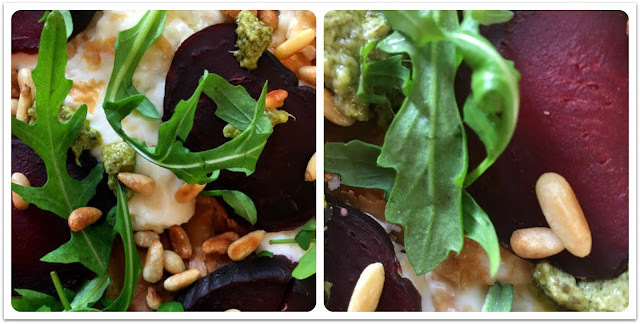 I am saving the tart recipe for future reference - I love beets and goat cheese! But I am going to ignore the part about the dentist - ugh!